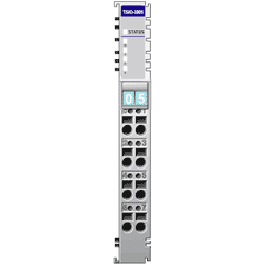 This module has 4 channels of sink type input and receives control signals with values of 48 VDC from digital field devices (sensors, etc.). 4 LEDs indicate device status and 1 LED indicates network status. A photocoupler provides electrical isolation between the controller and external field connections. The module has 2 wires. A 3-wire sensor (proximity, etc.) can also be connected.